Ministers are planning to announce a £100m scheme to test electric cars and vans in cities, with a view to expanding their use across the UK. BBC One's Politics Show has learned that manufacturers will be invited to bid to supply the vehicles. The UK is committed to cutting all greenhouse gases by 80% by 2050. But environmentalist George Monbiot said it was "crazy" that car manufacturers had to be "subsidised" to reduce emissions. Ministers hope the trials of electric cars and vans will take place in three cities, with the information collected from drivers forming the basis of bigger plans. Such vehicles are emissions free, and those available on the market usually cost between £9,000 and £12,000. Once fully charged they can travel up to 40 miles. The government says its £100m investment is worthwhile, as the UK is now committed to cutting all greenhouse gases by 80% by 2050 and that about 20% of those emissions come from road transport. 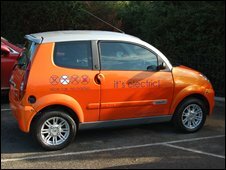 Of the UK's 26 million cars, only 0.01% are electric. But Mr Monbiot said: "It's crazy that the government is subsidising the motor industry for what it should be doing anyway. "Years ago, in 1998, the industry promised it would make a radical cut in the amount of carbon dioxide its cars are producing. "It's broken that promise, and now the government is paying it to do what it should have been forced to do through regulation". Currently no major manufacturer sells electric cars in the UK. Mr Monbiot said: "Subsidies are what governments pay when they don't have the guts to regulate powerful industries. "Instead of saying 'You must do that and we're the government and we're telling you what to do', they're saying 'We'll pay you a bribe please go ahead and do it'. "There isn't even any guarantee that this bribe will produce the right results." Paul Everitt, of the Society of Motor Manufacturers and Traders, said the big car makers were spending billions on developing green technology. But he added: "It's vital the government makes the UK a good place to do business. Global vehicle manufactures are just that; they're global. "They've got huge numbers of markets around the world in which they operate and they have a choice about where they do research, development and demonstration. "Making the UK a more attractive location for that kind of work is good for the economy and will make sure we are part of the low-carbon future." Aside from who pays, questions are being raised about the timing of this scheme. As the UK heads into recession, the tension between doing what is best for the economy versus what is best for the environment could be a problem for the government. Last week Gordon Brown insisted petrol companies drop prices at the pumps to help hard-up consumers. But Transport Secretary Geoff Hoon denied long-term targets would be set aside for short-term benefits. He said: "We must look at these things not only in terms of the impact on the environment but actually in terms of the impact of our economy and the truth is using low-carbon vehicles can often be a great deal cheaper than using their carbon emitting counterparts. "So looking at ways in which we help to develop that market is the right position for government to be in even in these difficult circumstances. " Critics say promoting electric vehicles only makes sense if other sources of pollution are tackled simultaneously. Shadow climate change minister Greg Clark said: "The government's policy when it comes to tackling climate change simply isn't joined-up. "They're signing up quite rightly to targets, but at the same time planning for a third runway at Heathrow and expanding the capacity at Stansted. "We think high-speed rail networks can help secure better transport for the future and help us meet our targets for reducing emissions."